Reading and share top 283 famous quotes and sayings about Yearning by famous authors and people. Browse top 283 famous quotes and sayings about Yearning by most favorite authors. 1. "LamentFor JAmong the small graves a soft shaft of sunlight gently rainsOn a memory; etches, as a glittering finger,Golden corn field hair, ignites eyes sweet as the seas blue plains,Traces lips pink as Marys carnation tears and lingersThen is gone. Oh ancient sun above how shall I tellOf the hearts deep yearnings that the years can never quell?" 3. "The ball was held in a middle-class home. The girls were anemic - some of them; the others were red as raspberries. John liked the pale ones best, the ones with black or blue rings round their eyes. They looked so sad and suffering and pitiable, and they cast tender yearning glances at him, such yearning glances." 4. "I took all the blame. I admitted mistakes I hadn't made, intentions I'd never had. Whenever she turned cold and hard, I begged her to be good to me again, to forgive me and love me. Sometimes I had the feeling that she hurt herself when she turned cold and rigid. As if what she was yearning for was the warmth of my apologies, protestations, and entreaties. Sometimes I thought she just bullied me. But either way, I had no choice." 5. "I'd finally come to understand what it had been: a yearning for a way out, when actually what I had wanted to find was a way in." 6. "Die Judenfrage,' it used to be called, even by Jews. 'The Jewish Question.' I find I quite like this interrogative formulation, since the question—as Gertrude Stein once famously if terminally put it—may be more absorbing than the answer. Of course one is flirting with calamity in phrasing things this way, as I learned in school when the Irish question was discussed by some masters as the Irish 'problem.' Again, the word 'solution' can be as neutral as the words 'question' or 'problem,' but once one has defined a people or a nation as such, the search for a resolution can become a yearning for the conclusive. Endlösung: the final solution." 7. "In a hyper materialist environment where everything is reduced to mere economic considerations, what we deem to be important is often trivial, a temporary fix for deeper and more profound yearnings.This has given rise to what some may describe as a unique pathology common to modern wealthy societies: moral and spiritual emptiness among opulence and material luxury." 8. "It was not the passion that was new to her, it was the yearning adoration. She knew she had always feared it, for it left her helpless; she feared it still, lest if se adored him too much, then she would lose herself, become effaced, and she did not want to be effaced, a slave, like a savage woman. She must not become a slave. She feared her adoration, yet she would not at once fight against it." 9. "I, answering in the end, began: 'Alas,how many yearning thoughts, what great desire,have lead them through such sorrow to their fate?" 10. "The swallow that hibernates underwater is a creature called yearning." 11. "Handel's yearning for independence from the traditional chains of patronage and his persistence in monitoring his productions resulted with unique developments concerning Baroque 'opera seria'; however, paradoxically his personal obsession to obtain complete artistic freedom generated disastrous side-effects that eventually impeded the progress of opera in London." 12. 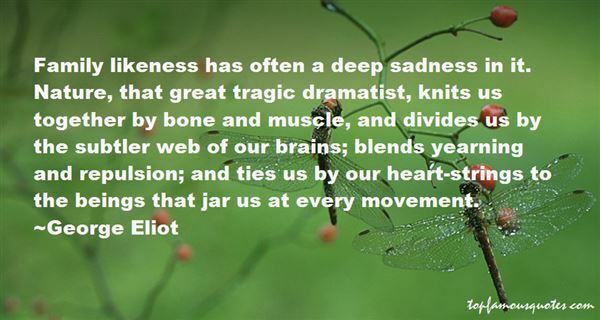 "Family likeness has often a deep sadness in it. Nature, that great tragic dramatist, knits us together by bone and muscle, and divides us by the subtler web of our brains; blends yearning and repulsion; and ties us by our heart-strings to the beings that jar us at every movement." 13. "For this is what we do. Put one foot forward and then the other. Lift our eyes to the snarl and smile of the world once more. Think. Act. feel. Add our little consequence to the tides of good and evil that flood and drain the world. Drag our shadowed crosses into the hope of another night. Push our brave hearts into the promise of a new day. With love; the passionate search for truth other than our own. With longing; the pure, ineffable yearning to be saved. For so long as fate keeps waiting, we live on." 14. "To be born means being compelled to choose an era, a place, a life. To exist here, now, means to lost the possibility of being countless other potential selves.. Yet once being born there is no turning back. And I think that's exactly why the fantasy worlds of cartoon movies so strongly represent our hopes and yearnings. They illustrate a world of lost possibilities for us." 15. 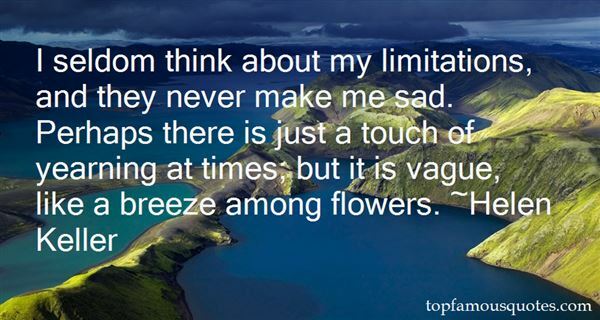 "I seldom think about my limitations, and they never make me sad. Perhaps there is just a touch of yearning at times; but it is vague, like a breeze among flowers." 16. "English literature, from the days of the minstrels to the Lake Poets—Chaucer and Spenser and Milton, and even Shakespeare, included—breathes no quite fresh and, in this sense, wild strain. It is an essentially tame and civilized literature, reflecting Greece and Rome. … Where is the literature which gives expression to Nature?...I do not know of any poetry to quote which adequately expresses this yearning for the Wild....The West is preparing to add its fables to those of the East. The valleys of the Ganges, the Nile, and the Rhine having yielded their crop, it remains to be seen what the valleys of the Amazon, the Plate, the Orinoco, the St. Lawrence, and the Mississippi will produce." 17. "Everyday brought me further away from other people, I had been placed out of the world's sight, as if in a cupboard, and I hoped it would stay that way. I developed a yearning for being alone, unkempt, untended." 18. "Being late was a special kind of modern suffering, with blended elements of rising tension, self-blame, self-pity, misanthropy, and a yearning for what could not be had outside theoretical physics: time reversal." 19. "If Epicurus were speaking to you at this moment, he would urge you to simplify life. Here's how he might put it if he were standing here today : " Lads,your needs are few, they are easily attained, and any necessary suffering can be easily tolerated. 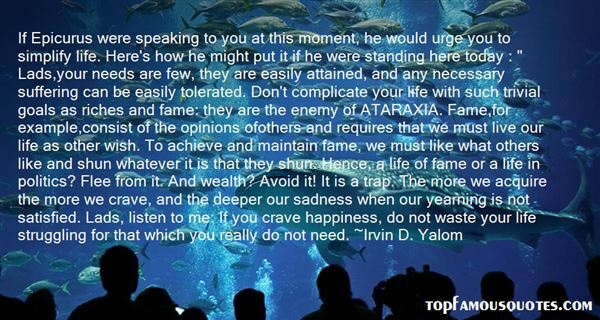 Don't complicate your life with such trivial goals as riches and fame: they are the enemy of ATARAXIA. Fame,for example,consist of the opinions ofothers and requires that we must live our life as other wish. To achieve and maintain fame, we must like what others like and shun whatever it is that they shun. Hence, a life of fame or a life in politics? Flee from it. And wealth? Avoid it! It is a trap. The more we acquire the more we crave, and the deeper our sadness when our yearning is not satisfied. Lads, listen to me: If you crave happiness, do not waste your life struggling for that which you really do not need." 20. "But he cannot see a connection between the end of yearning and the end of poetry. Is that what growing up amounts to: growing out of yearning, of passion, of all intensities of the soul?" 21. "Republicans: steely, rational, paternalistic, respectful of authority, easy to herd, the party of No. Democrats: sugary, emotional, idealistic, yearning for novelty, hard to marshal, the party of Oh Yeah, Baby, Make Mama Feel Good." 22. "The emptinesss was a hole that only he could fill. He was the relief. It pulled from every direction, this yearning for him. All he needed to do was speak the words, "Kiss me," and I would obey." 23. "...that yearning inside you that seeks for fulfillment - does it still burn?..." 24. "Matthew and Lucinda felt at the exact edge of their lives, feeling them close, closer, as near at hand as yet elusive as the wind that whistled in their hair: the true complete lives in which they would at last drown, the oceanic voyage into their thirties and beyond, through which their inchoate yearnings would either be soothed or disappointed, or both." 25. "The goblins want girls who dream so hard about being pretty their yearning leaves a palpable trail, a scent goblins can follow like sharks on a soft bloom of blood. The girls with hungry eyes who pray each night to wake up as someone else. Urgent, unkissed, wishful girls. Like Kizzy." 26. "A sculpture of the magnificent shape of God. Oh, admittedly it was a shallow rendering of That Which Cannot Be Named; but art is not relative to perfection in any tangible sense. It is our coarse antennae trembling blindly as it traces the form of Origin, tastes the ephemeral glue welding us, yearning after the secret of ineluctable evolution, and wonders what this transformation will mean." 27. "But art is not relative to perfection in any tangible sense. It is our coarse antennae trembling blindly as it traces the form of Origin, tastes the ephemeral glue welding us, yearning after the secret of ineluctable evolution, and wonders what this transformation will mean. In my mind, here was the best kind of art—the kind hoarded by rich and jealous collectors in their locked galleries; hidden from the eyes of the heathen masses, waiting to be shared with the ripe few"
28. "The yearning sharpened into jealousy. Lillian knew that Westcliff would never truly be happy with the woman he was destined to marry. He would tire of a wife whom he could bully. And a steady diet of tranquillity would bore him abysmally. Westcliff needed someone who would challenge and interest him. Someone who could reach through to the warm, human man who was buried beneath the layers of aristocratic self-possession. Someone who angered him, teased him, and made him laugh. "Someone like me," Lillian whispered miserably." 29. "Spiritual yearning is the homesickness of the soul." 30. "And yet day and night meet fleetingly at twilight and dawn," he said, lowering his voice again and narrowing his eyes and moving his head a quarter of an inch closer to hers. "And their merging sometimes affords the beholder the most enchanted moments of all the twenty four hours. A sunrise or sunset can be ablaze with brilliance and arouse all the passion, all the yearning, in the soul of the beholder." 31. "Let us live happily, without hate amongst those who hate. Let us dwell unhating amidst hateful men.Let us live happily, in good health amongst those who are sick.Let us dwell in good health amidst ailing men.Let us live happily, without yearning for sensual pleasures amongst those who yearn for them.Let us dwell without yearning amidst those who yearn.Let us live happily, we who have no impediments. We shall subsist on joy even as the radiant gods." 32. "That is when I understood the magical meaning of the circle. If you go away from a row, you can still come back into it. A row is an open formation. But a circle closes up, and if you go away from it, there is no way back. It is not by chance that the planets move in circles and that a rock coming loose from one of them goes inexorably away, carried off by centrifugal force. Like a meteorite broken off from a planet, I left the circle and have not stopped falling. Some people are granted their death as they are whirling around, and others are smashed at the end of their fall. And these others (I am one of them) always retain a kind of faint yearning for that lost ring dance, because we are all inhabitants of a universe where everything turns in circles." 33. "The Greek word for "return" is nostos. Algos means "suffering." So nostalgia is the suffering caused by an unappeased yearning to return." 34. "Mesmerized, all she can do is watch this piece of her life move off; all she can do is watch it and suffer. She is experiencing a brand-new feeling called nostalgia. That feeling, that irrepressible yearning to return, suddenly reveals to her the existence of the past, the power of the past, of her past; in the house of her life […] from now on her existence will be inconceivable without these feelings." 35. "By means of poetry all this suffering and effort could be transformed into dream; no matter how much of the ephemeral existed, poetry could immortalize it by turning it into song. Only two or three primitive passions had governed me until this time: fear, the struggle to conquer fear, and the yearning for freedom. But now two new passions were kindled inside me: beauty and the thirst for learning." 36. "No one could possibly understand my purest feelings but I couldn't care less; My deepest yearnings are nobody's goddamn business anyway"
37. "Girl lithe and tawny, the sun that formsthe fruits, that plumps the grains, that curls seaweedsfilled your body with joy, and your luminous eyesand your mouth that has the smile of the water.A black yearning sun is braided into the strandsof your black mane, when you stretch your arms.You play with the sun as with a little brookand it leaves two dark pools in your eyes." 38. "Anything seemed possible, likely, feasible, because I wanted everything to be possible... Because I had no power to make things happen outside of me in the objective world, I made things happen within. Because my environment was bare and bleak, I endowed it with unlimited potentialities, redeemed it for the sake of my own hungry and cloudy yearning." 39. "I am a poor student sitting at the feet of giants, yearning for their wisdom and begging for lessons that might one day make me a complete artist, so that if all goes well, I may one day sit beside them." 40. "My godchild Zoe, age 6, suddenly said: "Can you describe what romance is?" I talked about wooing, and yearning, and she sighed and leaned back, "I think that love is my favorite thing in this whole world..." Me too, Zoe, me too." 41. "Every night I empty my heart, but by morning it's full again.Slow droplets of you seep in through the night's soft caress.At dawn, I overflow with thoughts of usAn aching pleasure that gives me no respite.Love cannot be contained, the neat packaging of desireSplits asunder, spilling crimson through my days.Long, languishing days that are now bruised tender with yearning,Spent searching for a fingerprint, a scent, a breath you left behind." 42. "A life without love is a waste. "Should I look for spiritual love, or material, or physical love? ", don't ask yourself this question. Discrimination leads to discrimination. Love doesn't need any name, category or definition. Love is a world itself. Either you are in, at the center…either you are out, yearning." 43. "Finn leaped from his horse to greet Enna, and she entwined herself into him, their arms around each other, their faces close. Thoug they did not kiss, Rin thought that the way they looked at each other was even more intimate. 'Let's get married,' Enna was saying with yearning in her voice. 'Please, let's get married right now.' Finn put his face into her neck and whispered something that made her hum." 44. "A bulimic person's shame may lead her to try to hide not only her eating-disorder behaviors but also her basic needs and yearnings. She may wish that her needs and desires did not exist and may try to act as if she does not need or want anything or anyone. When that attempt inevitably fails, she may wish that others could magically read her mind and respond to her needs and wants without her having to ask for anything. To avoid the shame of expressing her needs and desires, she turns to food, rather than relationships, for comfort"." 45. "And in the depth of her eyes were all these years—seasons they'd known, paths they'd trod.Slowly he entered her again. Everything reflected in her gaze: shyness, yearning, ripples of pleasure.The pleasure turned fierce, then ferocious. He labored to draw breath. In the wash of her climax, she closed her eyes. He closed his own eyes and yielded to the moment." 46. "God fills us with all sorts of yearnings that go against the grain of the world—but the fact those yearnings often come to nothing, well, I doubt that's God's doing." She cut her eyes at me and smiled. "I think we know that's men's doing." 47. "Gnostic tales tell of the homesickness of the soul, its yearning for its own milieu…"
48. "Toska - noun /'to-sk?/ - Russian word roughly translated as sadness, melancholia, lugubriousness. "No single word in English renders all the shades of toska. At its deepest and most painful, it is a sensation of great spiritual anguish, often without any specific cause. At less morbid levels it is a dull ache of the soul, a longing with nothing to long for, a sick pining, a vague restlessness, mental throes, yearning. In particular cases it may be the desire for somebody of something specific, nostalgia, love-sickness. At the lowest level it grades into ennui, boredom." 49. "This the touch of my lips to yours, this the murmur of yearning, This the far-off depth and height reflecting my own face, This the thoughtful merge of myself, and the outlet again. Do you guess I have some intricate purpose? Well I have, for the Fourth-month showers have, and the mica on the side of a rock has. Do you take it I would astonish? Does the daylight astonish? does the early redstart twittering through the woods? Do I astonish more than they? This hour I tell things in confidence, I might not tell everybody, but I will tell you." 50. "Along with the yearning that came from some deep part of her, that was selfless and exalted, Thea had a hard kind of cockiness, a determination to get ahead. Well, there are passages in life when that fierce, stubborn self-assertion will stand its ground after the nobler feeling is overwhelmed and beaten under." On our second date, she kissed me in a bar. I invited her home. We just caught the F train, which seemed like a good omen."